Type your question or stem in the Question box. 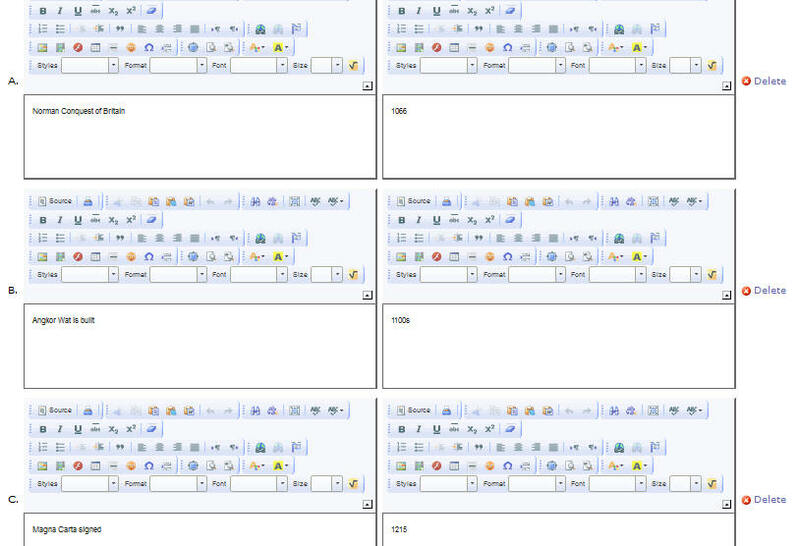 The title is an optional field. 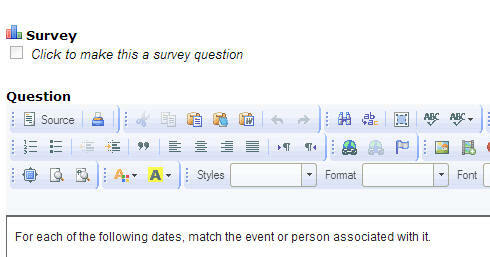 If you want the question to be a survey type, check the survey box. There will be no correct/wrong answers and the question will be worth 0 points. In the Choices area, enter a value in the left (choice) box with its matching value in the right box next to it. When creating the choices, it’s important to keep choices on the left and matches on the right, consistently. Don’t mix them up. For example, if you want students to be able to match events with dates, put all the events on one side and all the dates on the other side. The Distractor Choice allows you to add one more choice than you have a match for. This makes the question a little more challenging. You don’t need to add a distractor if you want everything to have a match. It is optional. You can add more pairs of choices by choosing how many more from the Add More Pairs drop-down box. There is a limit of 25 choice/match pairs. If your question is worth 5 points and you have 5 pairs, then each pair is worth 1 point. If your question is worth 5 points and you have 25 pairs, then each pair is worth only 1/5 point. Keep that in mind when assigning points to a pool and deciding how many pairs to put in the question. 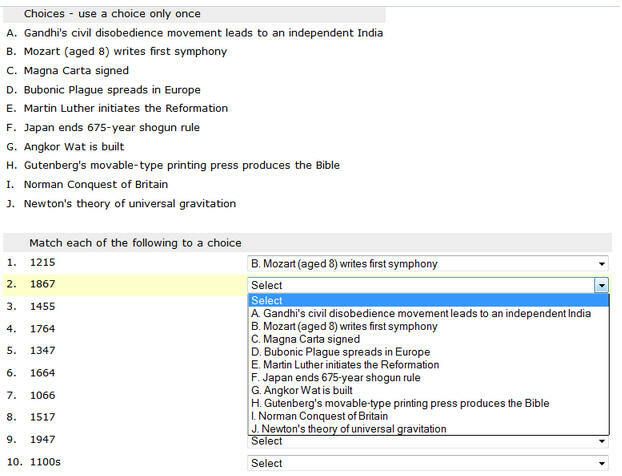 What does the matching question look like on the student side? Here is what the above question will look like when students are answering it. 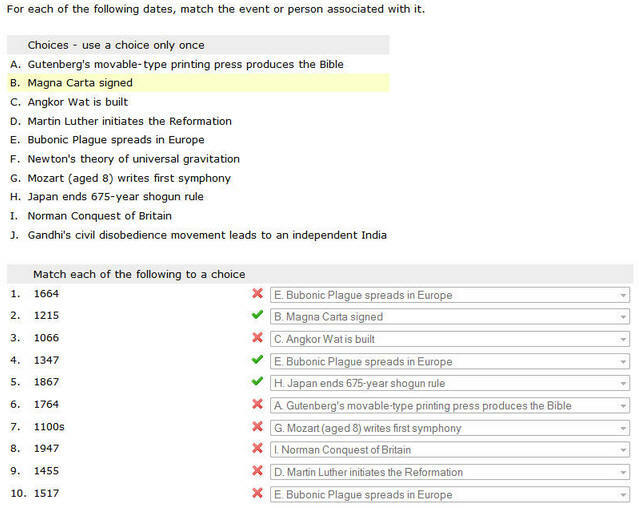 Other options for the matching question include checking reason and adding hints and feedback. If you check the Reason box, students will have a place where they justify their answer. Note that this will have no effect on their score unless you review their rationale for answer and manually adjust their point total. If you enter Hints in authoring, students will be able to view them WHILE they are taking the test, provided that you check “show hints” in the assessment settings. If “show hints” is enabled, students will be able to click on a link and they will see the hints you offered in an overlay pop-up window. 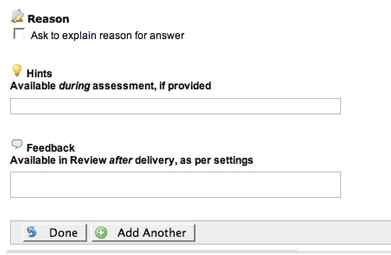 The Feedback area is where you can enter additional clarification information on the concepts covered in this question. This feedback will be seen by all students when they review their submission (if enabled in settings). Click on Done to complete the question and return to the list of questions in the pool, or click on Add Another to add this question to your pool and continue authoring more questions for the same pool. At the bottom right corner of the question page, AT&S provides information with the unique question id, as well as information as to when and by whom the question was created and modified.